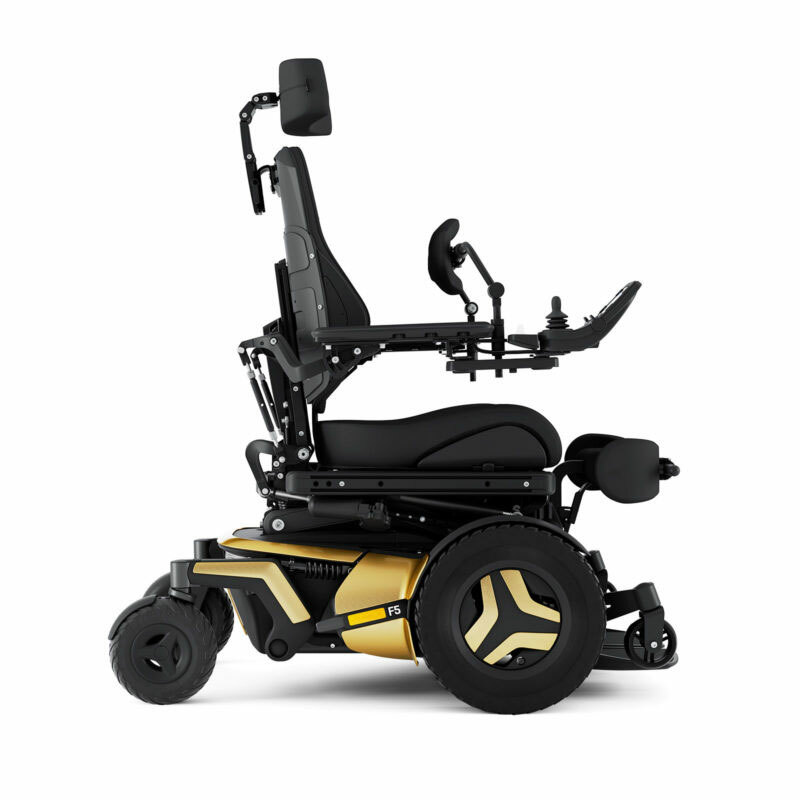 Permobil F5 Corpus VS standing wheelchair features an innovative new way of standing, allowing you to choose from two positions, Sit-to-stand or Lay-to-stand. 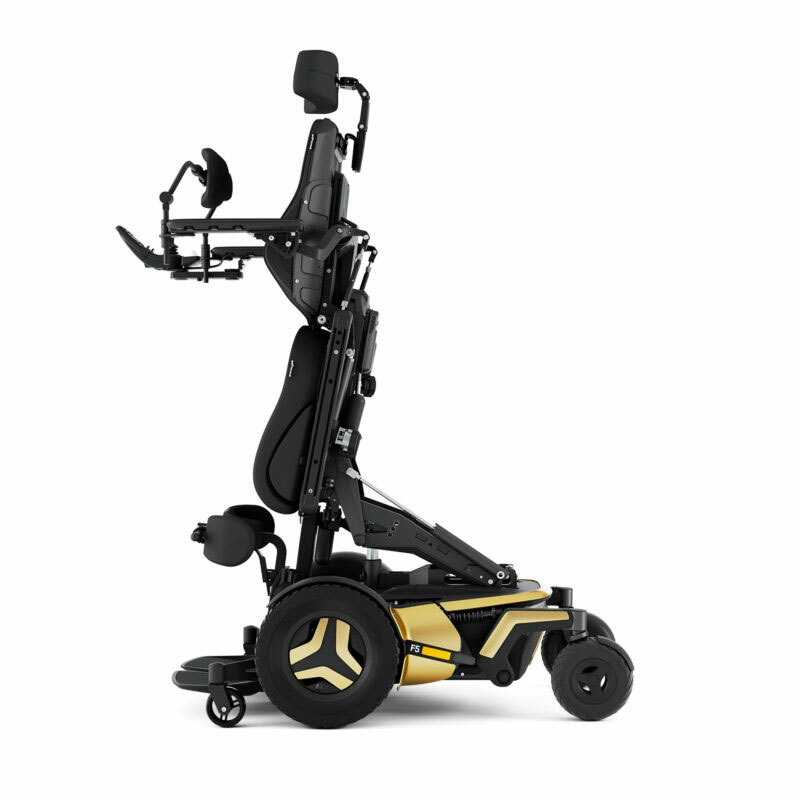 Giving you greater independence and freedom, the F5 Corpus VS features fully independent suspension and automatic, self-adjusting support wheels, providing a new level of comfort and stability, especially when you stand and drive, indoor or outdoor. 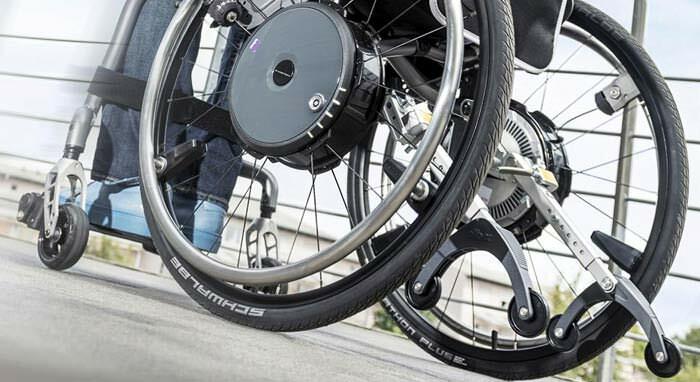 F5 Corpus is an addition of many small, smart improvements that makes the new F5 Corpus VS an ideal wheelchair for users with varied requirements. 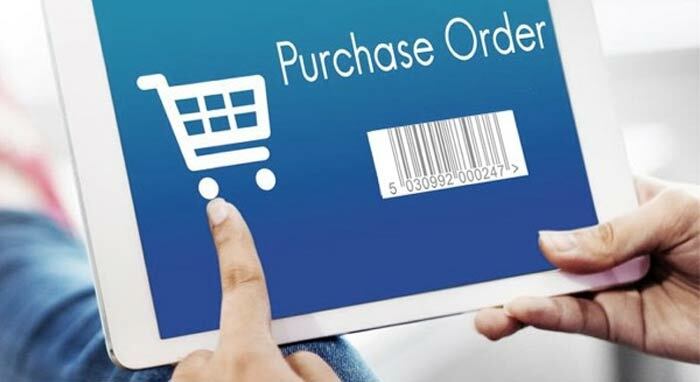 F5 Corpus helps to maintain and improve user mobility, independence and health by enabling users to reach a little bit further, stand a few minutes longer, endure even tougher challenges and get more out of everyday life. 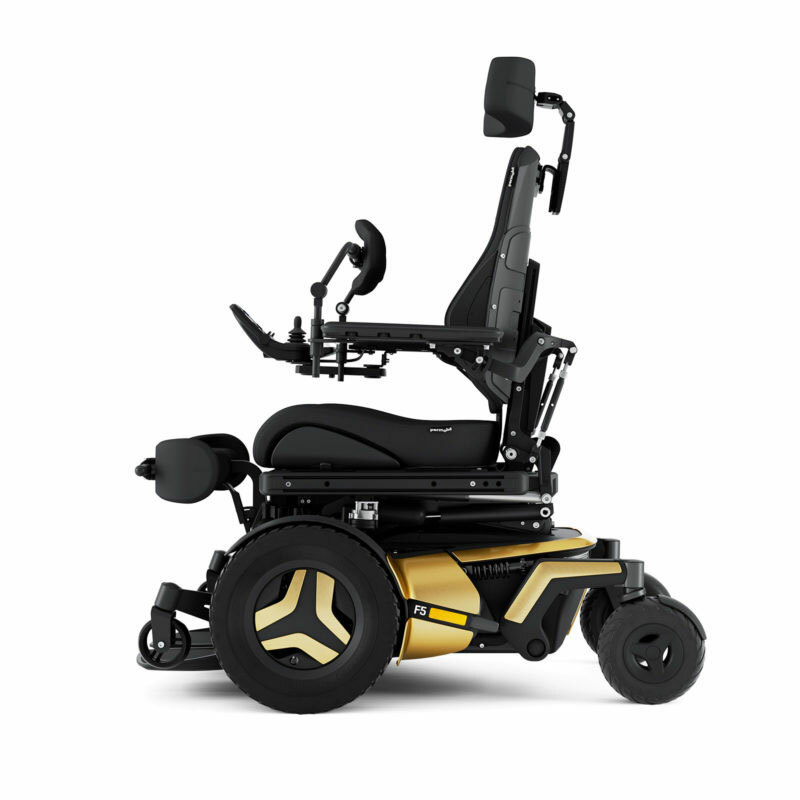 Permobil combined all of the performance features of the F5 Corpus with superior power standing functionality. Fully programmable standing sequences allow user position to be optimized using supine, semi-reclined or sit to stand techniques. 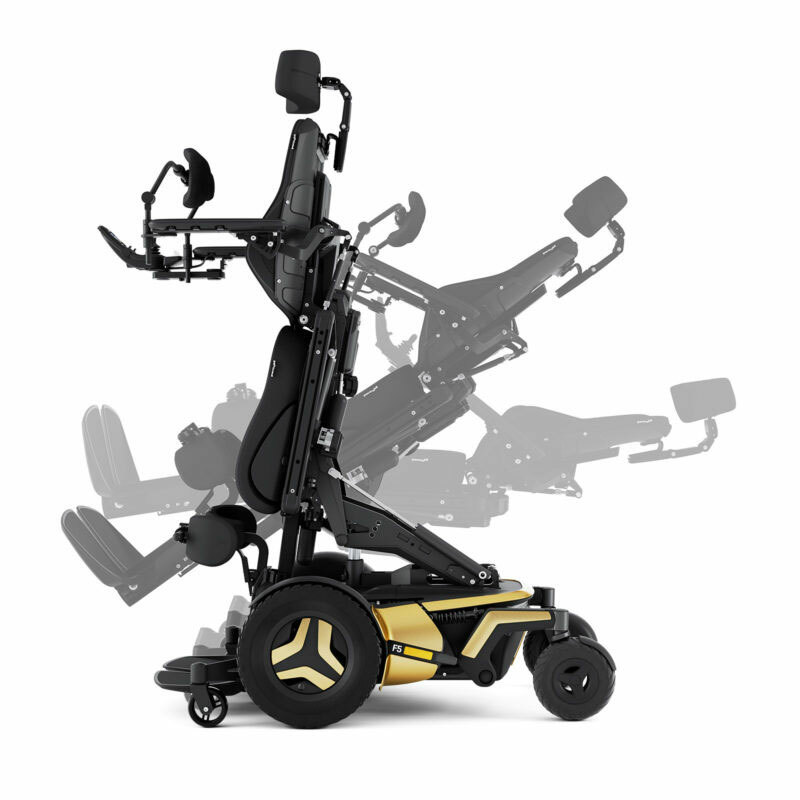 Further customize standing positions with adjustable anterior chest pad, moldable knee supports and power articulating footplates. 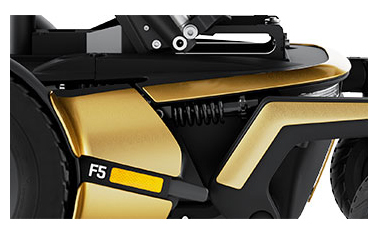 From face-to-face interactions to improved health outcomes, the F5VS empowers you to explore the vast array of standing benefits. Superior Suspension: Conquer your world with ComfortRide and ComfortRide Pro fully independent, adjustable suspension. Enjoy superior vibration reduction, ride comfort and drive performance for the widest variety of driving scenarios. 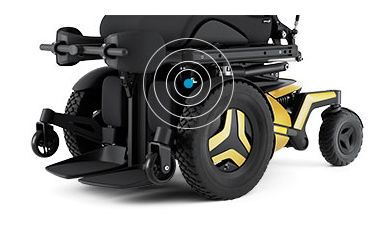 The front wheel driving experience is further enhanced by our patented ESP (Enhanced Steering Performance) gyroscope tracking technology, which provides exceptional tracking at high speeds, on side slopes or with alternative drive systems. The world isn’t one dimensional. Your seat elevator shouldn’t be either. 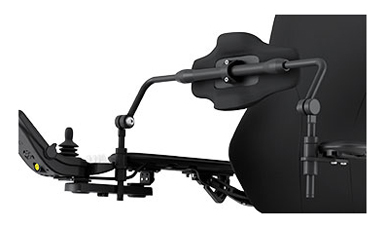 ActiveHeight™ elevation and ActiveReach™ forward tilt perform seamlessly to create a seating system like no other. 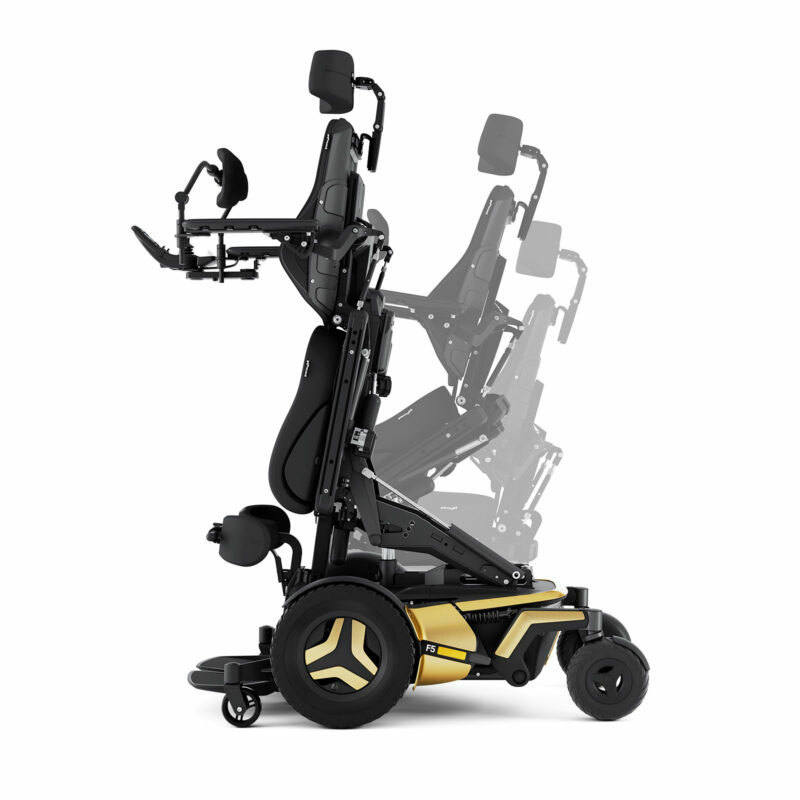 With up to 14” of vertical seat adjustment and 45° of ActiveReach forward tilt capability, the F-Series empowers you to reach for more and go further faster with new elevated drive speeds of up to 3.2mph. Rise above the status quo with 12" and 14" seat elevator options that help you reach new heights. 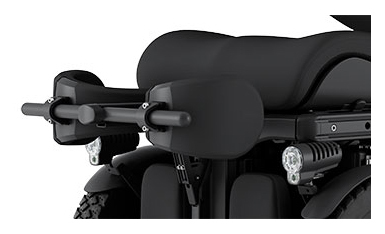 While elevating, the seating system repositions 3.5" to maintain optimal forward stability. At full elevation, keep pace with a top speed of 3.2 MPH. 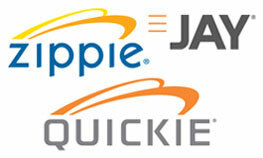 ActiveReach™ technology enables you to reach for more by creating 4.5" of additional reach. This can be used for reaching beyond obstructions, into high cabinets, or even assist in transfers. Truly putting your world into reach. While functional reach and transfers are improved using a seat elevator, many functional tasks are still limited as the chair is positioned sideways to the task at hand or your knees are unable to remain under tabletops. Permobil’s ActiveReach™ pairs 12" and 14" of seat elevation with functional reach packages so that you can face your objectives as well as a variety of possible transfer positions. High power LED head lights: The New high power LED head lights are twice as bright, making it easier to see and be seen. With a sleek new design, expanded color/hydrographic options and powerful new LED lighting you should be prepared to turn a few heads in your new F-Series. Reducing Contractures and Spasticity: Extension of the upper body and alignment of the hip assists in delaying skeletal deformities, provides knee range of motion and reduces spasticity, which can contribute to safer transfers and improved positioning in the wheelchair. Enhancing Blood Flow: Standing upright, changing position in chair, removes constrictions to circulation created when sitting, also helps in reducing edema. Breathing Easier: When standing, the chest cavity is expanded, making diaphragmatic movements and breathing easier. In turn, improved breathing often helps a person’s ability to communicate by making speaking easier. Stronger and Straighter Bones: Weight bearing from standing has shown to be effective in improving bone mineral density. Improving Bladder/Bowel Function: Risk of bladder infection is decreased as it makes it easier to empty the bladder completely. Enabling Participation: Seat elevating helps the user make eye contact while the anterior tilt function helps the user reach further forward for objects. Small improvements like these make participating easier, improving self-confidence and further increasing the desire to take part in daily life as much as possible. Reducing Risk of Pressure Ulcers: Offers regular pressure relief and improves sitting tolerance for those areas active when sitting or lying down. 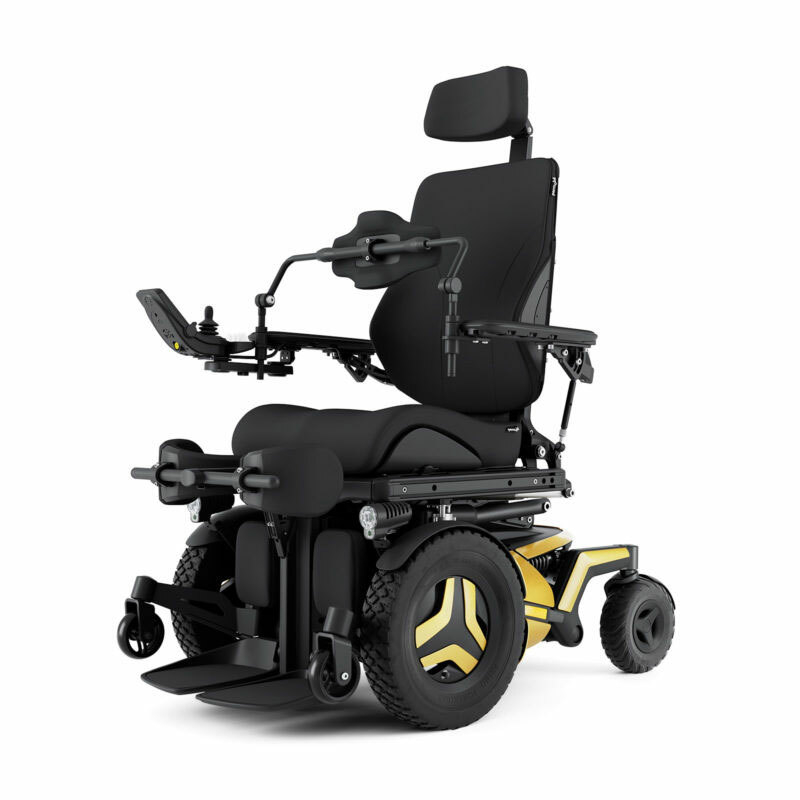 Safer Transfer: Enables safe transfers – and functional access forward – with the help of seat elevating and anterior tilt. 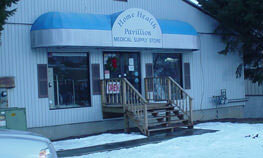 Functional Benefits: Maintains flexibility and allows for functional benefits in activities of daily living, such as better functional reach, seeing over obstacles, getting dressed and catheterization. 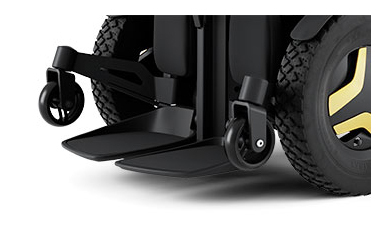 Seat height with electric seat lift 17.71" - 31.49"
Weight including batteries 432.1 lbs. Maximum user weight “Sit-to-stand” (max 80˚) 299.8 lbs. Maximum user weight ”Lay-to-”Stand” (max 80˚) 242.5 lbs. Backrest width 14.17" / 16.14" / 18.11" / 20.07"
Backrest height 23.4" / 24.4" / 25.3" / 26.37"
Distance between armrests 14.96" - 18.89" / 18.89" - 22.83"
Armrest height 8.46" - 13"
Turning diameter (ISO 7176-5) 60"
Obstacle capability 2.7" - 3.93"